"Biddle Butte (Mount Zion), Washington"
Click image to enlarge Biddle Butte, Washington, from Rooster Rock State Park, Oregon. 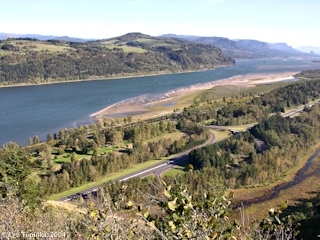 Columbia River and mudflats below Rooster Rock are in the foreground. Image taken October 18, 2003. 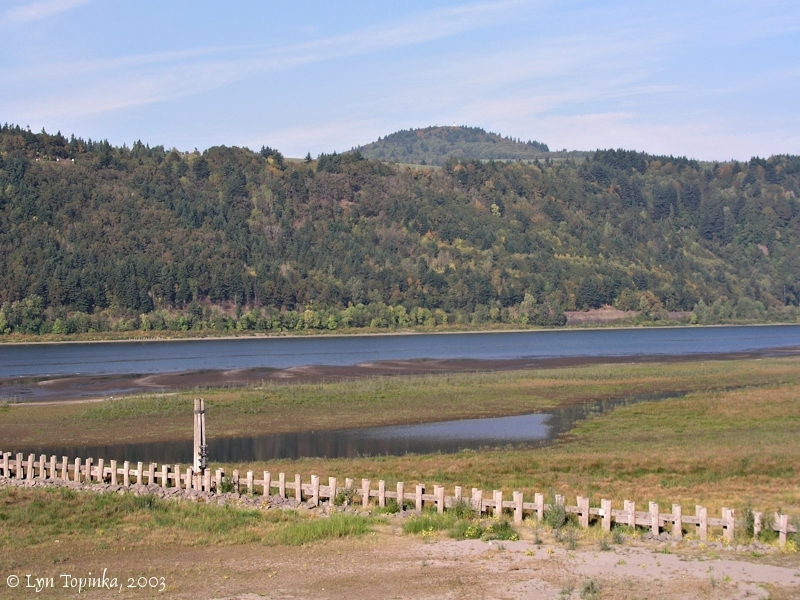 Biddle Butte (also known as Mount Zion) is a small 1,368-feet-high Boring Lava cone located in Skamania County, Washington, at Columbia River Mile (RM) 132, two miles west of Prindle and ten miles east of Washougal. 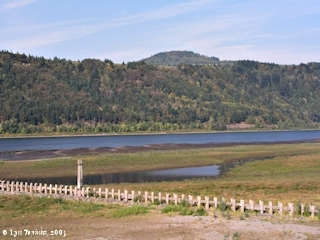 Upstream is located Beacon Rock. 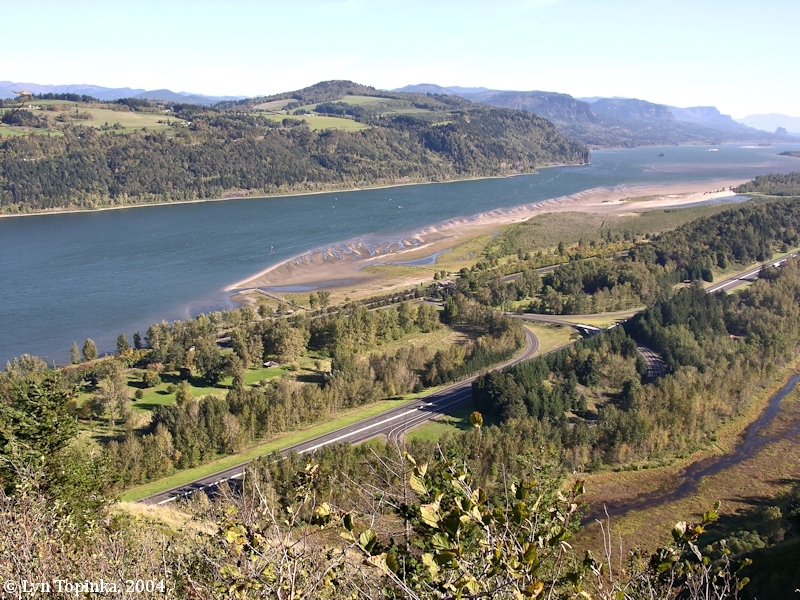 The Butte was named for Henry J. Biddle, an early conservationist of the Gorge. 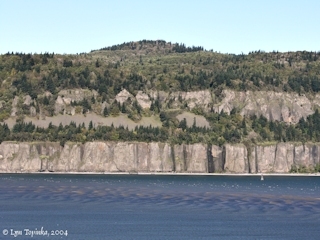 Biddle Butte looms over the basalt cliffs of Cape Horn. An early name for Biddle Butte was "Cape Horn Mountain". Good views of Biddle Butte can be had from across the river at Rooster Rock State Park and from the Bridal Veil Overlook. Biddle Butte (Mount Zion) is a small olivine Boring Lava Field shield volcano that postdates the Troutdale Formation. 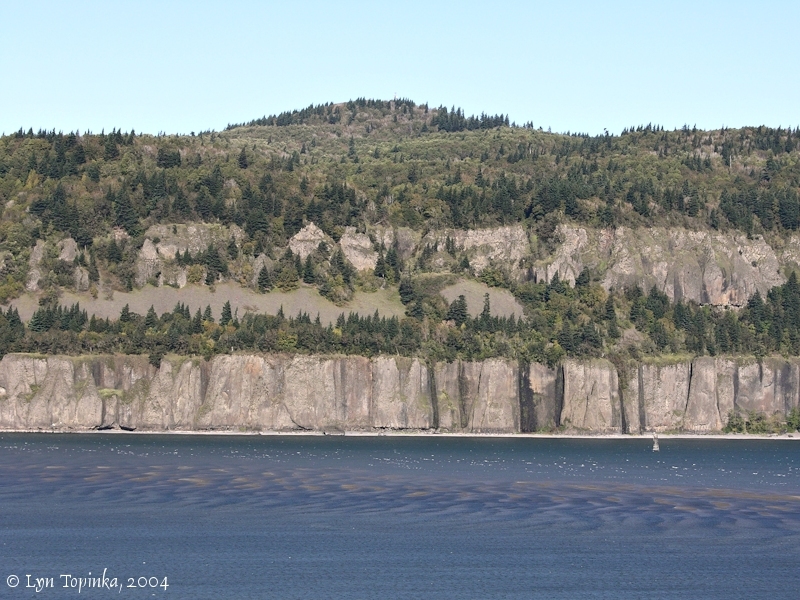 A small basaltic-andesite intracanyon flow can be seen emanating from Biddle Butte. Biddle Butte lava caps the Cape Horn basalts. Similar Boring Lava vents in the Portland, Oregon, area are inferred to be less than 730,000 years old. An 1860 cadastral survey (tax survey) for T10N R5E shows today's Biddle Butte being called "Cape Horn Mountain". The 1911 U.S. Geological Survey's topographic map "Mount Hood and Vicinity, Oreg.-Wash.", 1:125,000, shows the name "Mt. Zion", with an elevation of 1,458 feet. The 1948 and 1966 NOAA chart #6156, "Columbia River, Vancouver to Bonneville" and the 1985 chart #18531, "Columbia River, Vancouver to Bonneville", shows "Mt. Zion", with an elevation of 1,458 feet. The U.S. Board of Geographic Names made "Biddle Butte" the official name in 1989. 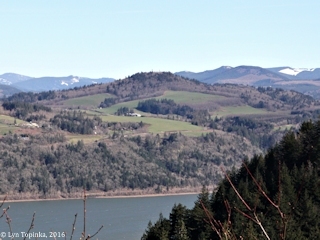 Click image to enlarge Cape Horn, Washington, with Biddle Butte above, from Bridal Veil Overlook, Bridal Veil, Oregon. Image taken October 11, 2004.